I am – or I used to be – a keen festival goer, but I have to confess I have never visited the ongoing Volt Festival, which is in my neighborhood. Actually, it is a one-hour car ride from my house. I do not know how it happened, or did not happen, but perhaps the reason is not too important, especially because there are not special reasons. It is more important that this festival is generally considered to be the best one in Hungary, because it’s size is just perfect: big enough to invite international names, but small enough to feel home. The location is a small, historical town, Sopron, next to the Austrian border, which means not only it is comfortable to get there from western countries, but also means a good infrastructure and a “civilized” atmosphere. This year about 100 thousand people are expected to visit the 5-day event, which is quite considerable, because only 60 thousand people live in the town. 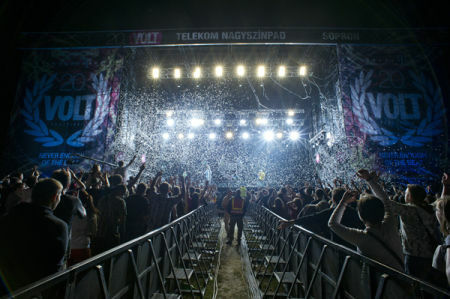 This post made me think it is perhaps not absolutely useless to make a list of some Hungarian pop festivals that might be interesting for foreigners. Take a look at my selection. To Whom? Who likes smaller festivals and want to know about Hungarian bands. To Whom? Who would like to have a swim in the Hungarian alternative culture.